The concept of transformative works is not new; it dates back as far as history goes. Typical examples include the Gospels (written hundreds of years after the life of the historical figure of Jesus) and Dante’s Divine Comedy (a self-insert version of the author palling around with his favorite poet, Virgil). In the 20th century we have Sherlock Holmes fans writing their own eccentric-genius stories (the Baker Street Irregulars through Laurie King), Star Trek fans writing licensed tie-ins and episodes of the show (Diane Duane, among others), and writers and artists gaining fame in fandom before, or while, writing or drawing original fiction and art (E. L. James and Noelle Stevenson as two prominent examples). Obviously, transformative works vary in quality. Not every fan movie is watchable, and not all licensed novelizations of movies turn into works worth reading. But the best transformative works bring something new to the original and succeed on their own. A Klingon Christmas Carol is a doubly transformative work: it’s a retelling of Charles Dickens’s A Christmas Carol through the lens of Star Trek’s Klingon culture, playing off of the canonical Klingon penchant for transforming other Terran works (Shakespeare, mostly). It’s a play performed entirely in Klingon with supertitles, written by Christopher Kidder-Mostrom and Sasha Warren, originally translated by Laura Thurston, Bill Hedrick, and Christopher Kidder-Mostrom, and more recently translated by Chris Lipscombe. If one wants a basic primer on what a performance of this play is like, fellow Twin Cities Geek writer Katy Kelley’s review from last year will provide most of the important details. What I’d actually like to discuss are a few of the more, well, transformative aspects of the production and performance. The one that’s gotten the most press recently is the casting of Scrooge—SQuja’—as a woman this year, the role performed very ably by Lana Rosario. (Tiny Tim, tImHom, is also played by a female actor, Gillian Chan.) The only changes in the dialogue, as far as I could tell, are in the gender markers: she instead of he and aunt instead of uncle. 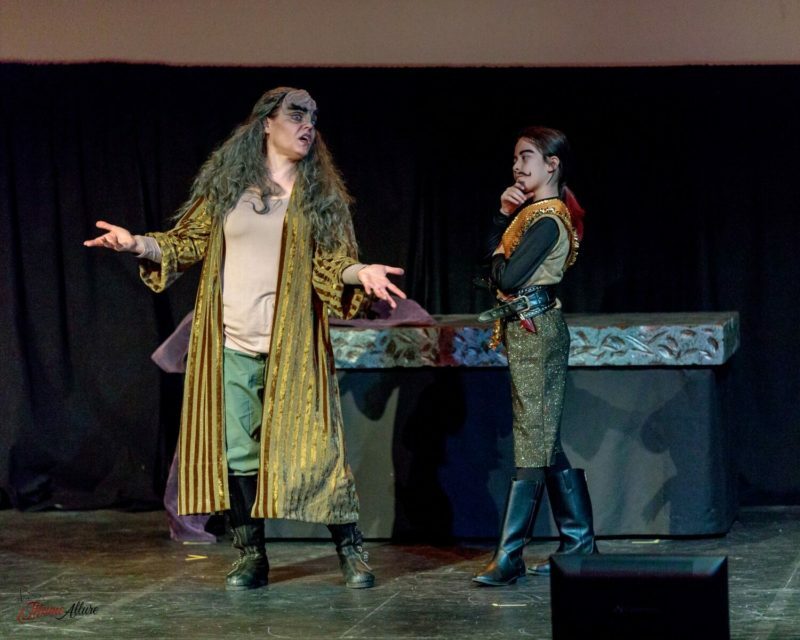 The fictional Klingon culture doesn’t particularly differentiate between men and women in certain ways; everyone is expected to be a warrior, and while women are often barred from holding certain political positions, that isn’t relevant for the story. It’s a common and necessary type of LGBTQIA+ representation: the “we are just like you” argument that formed the basis for marriage equality and rights in general. Because of the lack of changes in the script, any real differences are subtextual—those brought by the viewers and the lens of external society. For example, the Rite of Ascension and the “River of Blood” bring different overtones when SQuja’ and tImHom are coded as female instead of male. The gender change in this production is not necessarily one that grapples with concepts of queerness or gender particularly deeply, but neither is necessary for the story. Viewers paying attention will be able to interpolate the different undertones by themselves. Another equally interesting aspect of the story, to me, is the interpretation of Tiny Tim’s/tImHom’s story through the lens of Klingon culture. Star Trek as a franchise has elicited mixed responses with its handling of disability over the years. Geordi La Forge with his visor and the deaf negotiator, Riva, in the Star Trek: The Next Generation episode “Loud as a Whisper” are considered well-done representations. But Trek’s inability to allow wheelchair-using personnel to serve on ships despite fancy future technology allowing wheelchairs to do things that are impossible these days—see Captain Pike, for example, promoted to admiral in the alternate timeline—is generally considered a poor handling of the topic. In any case, tImHom is, as in the Dickens analogue, disabled; unlike the Dickens version, however, tImHom was born into a warrior race and is still expected to do what all the other warriors do: namely, pass the Rite of Ascension, which mostly involves getting hit with a pain stick. The contrast between SQuja’ (able bodied other than her age, but a coward) and tImHom (disabled but having the “heart of a warrior”) is obvious in general, but when they are both cast as women, it becomes very interesting. However, A Klingon Christmas Carol’s handling of disability holds interesting nuance beyond this. Another character comments that tImHom will be able to learn to work within her limitations and still be a warrior; effectively, they say that given proper training and accommodation, there’s no reason she can’t fully participate in society. When she falls, later, she isn’t given a hand up because she doesn’t need one—not because it would be un-warrior-like to accept help, but because her parents know what she can do. 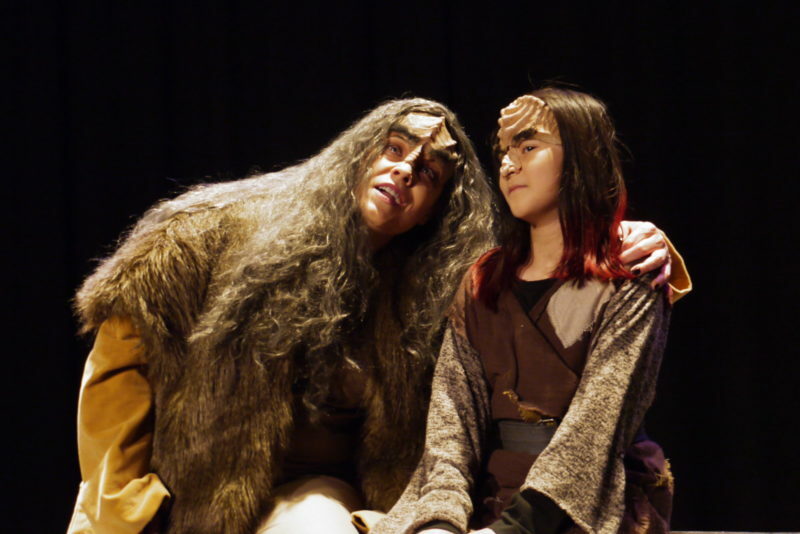 They are standing nearby, but she does stand on her own, and at several points in the play she is the one to call out “We are Klingons!” and prompt a response in kind. She is a Klingon, and she is treated as one. In canon, Klingons who cannot stand and face the enemy as warriors are expected to commit ritual suicide. (See the episode “Ethics” in the fifth season of TNG.) While the dichotomy between what Klingons believe and what Picard and Riker believe, as Terran humans, isn’t quite as simple as “living with disability” versus suicide—see this excellent essay—what we know about Klingon culture in canon seems to support a very ableist view. In following the Dickens-canon story of Tiny Tim, however, A Klingon Christmas Carol has given more to the story: there is no reason that, provided they have the right training, someone who wants to be a warrior cannot be one, regardless of size or how well their knees work. Warriors fight in different ways. This also intersects interestingly with the assertion by SQuja’ that she became an accountant and moneylender because someone has to stay home and deal with the day-to-day running of the empire. Of course it’s indicated that she does that because she’s a coward, but she’s not necessarily wrong. It’s a short play, an hour and a half with a short intermission, but it’s also based on a short novel, and like the novel, it doesn’t need any more time than it takes. It’s a very interesting transformation of both Dickens and Star Trek, and on top of that, it’s a funny, clever, and heartwarming show with bang-up performances by Rosario as SQuja’, Chan as both tImHom and the Ghost of Kahless Past, and the rest of the cast. 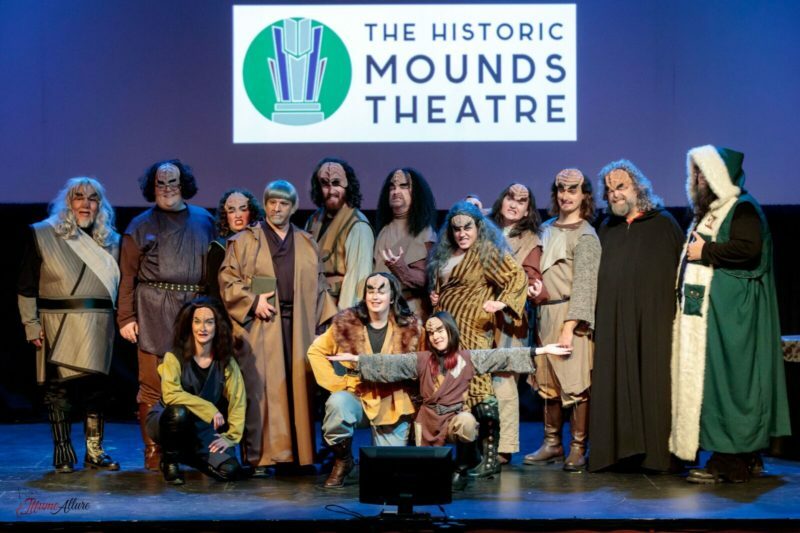 A Klingon Christmas Carol runs Fridays and Saturdays at 7:30 p.m. and Sundays at 4:30 p.m. through December 23, 2017, at the Historic Mounds Theatre in St. Paul. Tickets are available here.